I have this amazing friend Carly. I met her last year when I bought an older model drum carder from her. She’s a member of Ravelry, and I became aware of her through the LSG off-shoot group, LSG Spinners and Dyers. Carly is multicraftural – she dyes wool, spins it, then weaves or knits with it. She’s also an accomplished woodworker and seamstress and makes the most delectable baked goodies. In essence, she is a tattooed version of a modern day domestic goddess. I was having a crappy morning yesterday, mostly due to being overtired and sleep-deprived, and was feeling lacklustre about heading out to my weekly craft meet-up. But the promise of nice tea served in fine china and gluten-free baked yummies was too much to resist. Especially since I had a ride arranged as well! Excuses done with, I went over with a mending project and to get back to work on my socks (more on that later). In short, I had a lovely time with both Carly & Monica. 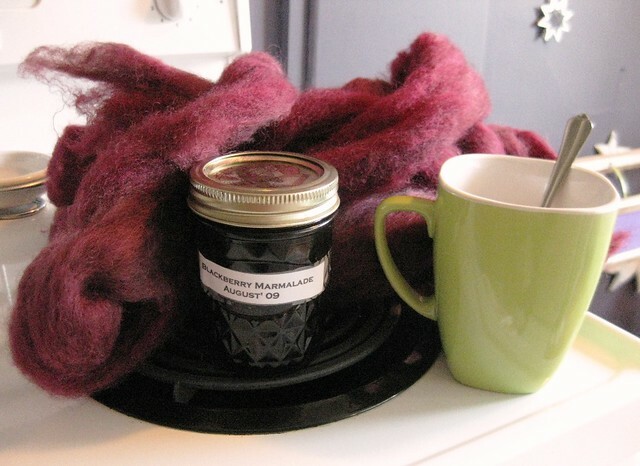 We listened to some music, had earl grey tea, and noshed on some yummy gluten-free pop-overs with butter and Carly’s absolutely divine homemade blackberry marmalade. I enjoyed it so much, she sent me home with 4 more pop-overs, a jar of said jam, and some spinning fibre that she dyed herself. Talk about generous! I’m still trying to figure out some way to give back considering Carly knows all (if not more) of the crafts that I do. Hmmm. In other news, my Ravellenic socks so missed the finish line. I got drunk in mid-August at a picnic (culprit – dandelion wine, but was so worth it) and ended up screwing up the pattern. I did tink back at the time and then gave up. 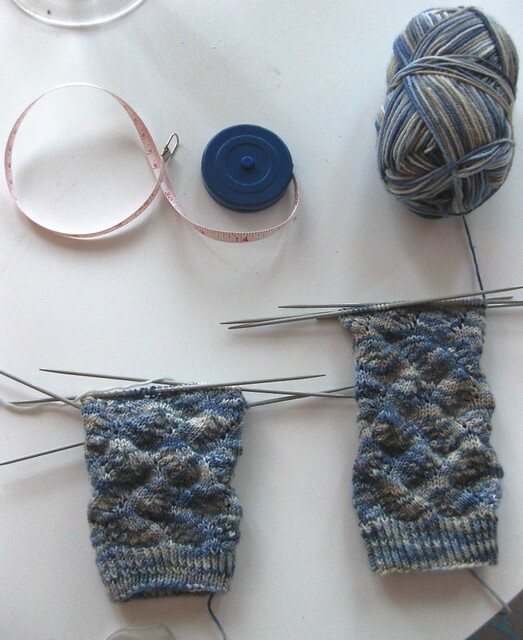 So I’m happy to report that I’m moving forward once again on the second sock. Don’t believe me, check the picture below for proof. § 2 Responses to The Kindness of Crafters"
Yum! Sad that I missed the jam by leaving early. I hope Carly’s other friend showed up for his spinning lesson. You make made me blush, and I ♥ you. Also, looking at the first picture I realized the colour of the wool is the same as the colour of my hands after a good blackberry picking session. Kismet! You are currently reading The Kindness of Crafters at When Gaia Smiles.